Girl Up North: Is Garnier Ultimate Blends Dry Shampoo better than Batiste? Is Garnier Ultimate Blends Dry Shampoo better than Batiste? I love dry shampoo, it's a staple in my little bathroom collection, but there are certain aspects of Batiste shampoo that I'm not really keen on; namely the white powdery scalp and weird feeling hair after using it. 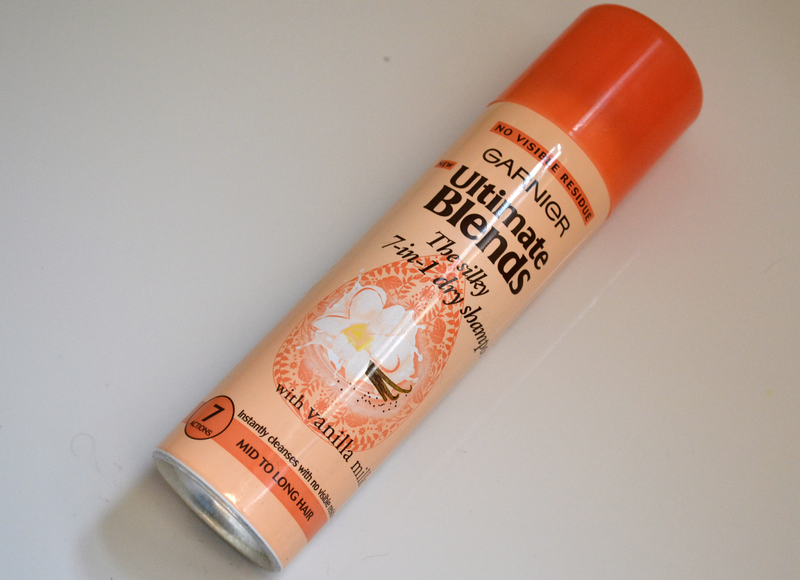 If you feel my pain where Batiste is concerned then you'll be pleased to know that I found a little gem in Morrisons in the form of this new Garnier Ultimate Blends 7 in 1 dry shampoo. Garnier claims that their new dry shampoo has '7 actions': 1. Instantly cleanses 2. Absorbs grease at the roots 3. Lightweight feel 4. Hair feels supple to the touch 5. Hair easy to detangle 6. Blissful fragrance 7. Leaves no visible residue My thoughts: Garnier seem to have reverted back to 80's/90's style packaging, I personally think this can looks like it could be 20 years old with the colour and design... not that it really matters, just an observation. This is applied in pretty much the same way as Batiste, you spray it onto your roots, leave it for a couple of minutes then style your hair as you normally would. The first thing I noticed was the smell; I got one for 'mid to long hair' and it smells of peachy vanilla... I really really like it, it's a lot softer smell than some of the Batiste ones which can be a bit too much. Secondly the spray is so lightweight, as soon as I spray Batiste on my hair I can feel all the little particles on my hair which is what gives the feeling of dry, strawy hair (which I hate), Garnier Ultimate Blends is the total opposite. I actually thought that it wasn't absorbing any oil when I first applied it but after 2 minutes my hair looked far better than it did before but texture wise it didn't feel any different; still soft and touchable. Finally I can confirm 100% that there is no white residue, which of course is a massive plus because Batiste is quite well known for leaving that white powdery look all the way down your scalp if you're not careful! It is slightly more expensive than Batiste at £3.99 a bottle but I for one will definitely be stocking up when I see it on offer. I would 100% recommend this for you to try if you're looking for a new dry shampoo, I've tried other dry shampoos and until now nothing has come close to Batiste but Garnier have really made an effort with this and I do think it'll be the next best thing in dry shampoo. There is also a dry shampoo for 'normal' hair with Chinese green tea and lemon extracts and of course the Ultimate Blends range extends to shampoo and conditioner for all different hair types. I thought exactly the same about the packaging of the whole new range, it's very late 80's/early 90's Timotei!